Treat yourself or your favorite angel to this personalized treasure. 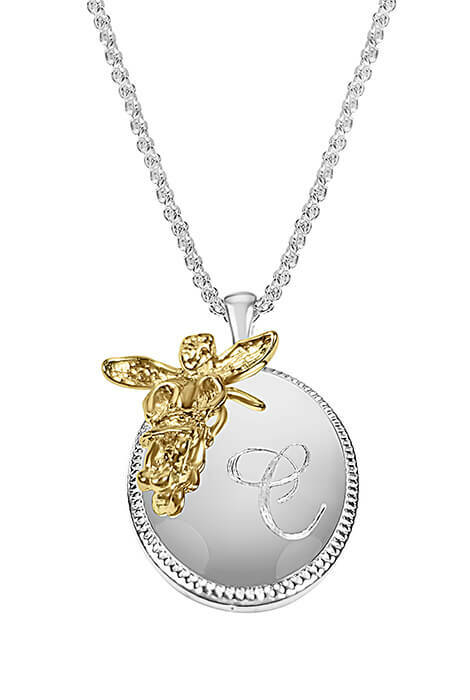 Sleek pendant features a goldtone angel perched on a silvertone oval that can be personalized with an elegant script monogram. Pendant includes a 17 1/2" long rope chain with lobster clasp. Makes a great gift! Specify 1 initial. Zinc. Allow 4–6 weeks for delivery. Goldtone angel perched on a silvertone oval. 17 1/2" long rope chain with lobster clasp.